As you may have figured out by now, I am bored today and cruising MM for neat things. It has been hard to edit my impulses to post every cool thing I see, but some of these ideas simply MUST BE released on my fellow forum dwellers! 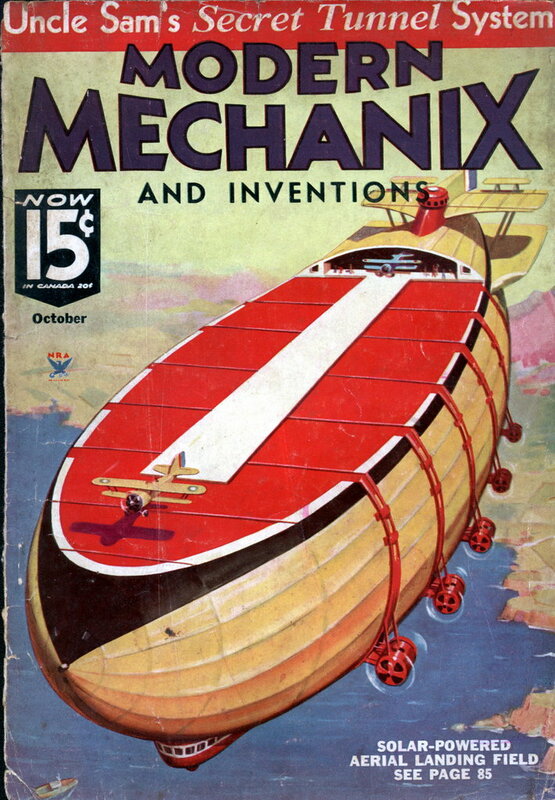 Such is the case with this beauty, a "Solar Powered" airship from Modern Mechanix of Oct 1934. I love the roof mounted runway cause that just seems like the right way to do it rather than using hooks to launch and recover from underneath. The idea of adding solar electric technology to Crimson Skies has a strong appeal to me as it would help to greatly enhance the pulp feel of the genre. 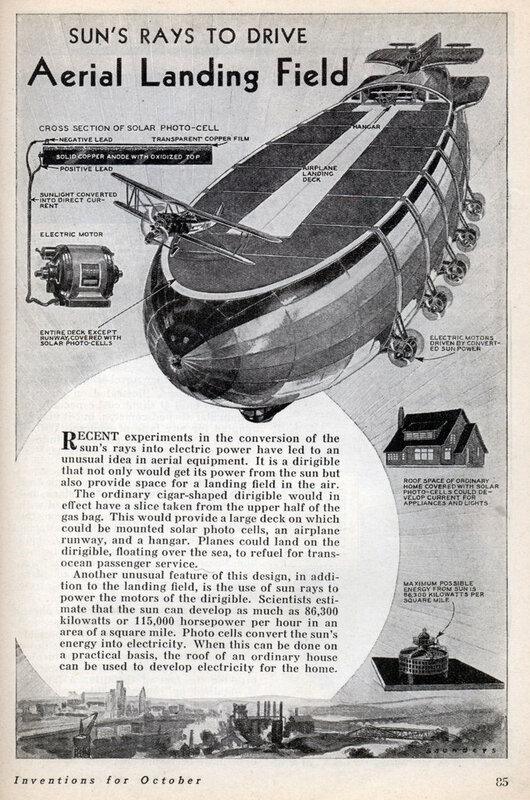 The idea of covering the upper exterior of an airship with solar cells seems perfectly natural. Fuel could be saved for emergency power for back generators or night operation when the batteries get low. I like it! I am absolutely in love with this concept. Picture a double bag (Two airship envelopes), set up side by side, with a topside runway mounted on a rigid external framework between and around them, Solar panels on the roofs of both bags and down the two exposed outer sides. Batteries are, by their nature, very heavy, so that is why we need the double bags to carry them, they will have to be slung low between and below the two bags like a heavy ships keel to help keep everything stable and counter the weight of the landing strip on top. The cabins will be in the interior of the bags while the hangers will be in the framework structure between the bags. Diesel electric generators power electrical motors and ships systems with the solar panels giving supplemental power. At lower cruising speeds in good bright sunshine, an airship of this nature just might even be able to operate indefinitely on solar power alone, producing enough power to power the motors and charge the batteries for night operation. . .
Pulpy enough to be perfect! I realize that 1930's era solar cells are going to leave a lot to be desired, so the name of the game will have to be massive overkill, thus the need to cover nearly every exposed available surface with solar cells. It's going to be heavy, but probably not impossibly so. It might even maneuver like a sloth, but it should be very stable and given decent weather, and it should be able to cruise for a very very long time using minimal resources. Perfect for a pulpy mad scientist wannabe warlord!